Is the Economy Getting Stronger or Weaker? Yes! No! We Have No Idea! Here's one thing we know about the economy. It's getting stronger. Just look at the GDP figures. After flailing at 0.4 percent growth in the first three months of this year, we've kicked up to 1.3 percent and 2 percent in the last two quarters. Recovery autumn! So what's the deal, is the economy getting better or worse? Yes! No. Probably? We don't really know. Fourteen trillion dollars is a lot to measure. The Bureau of Economic Analysis does its best. But sometimes, they mess up. 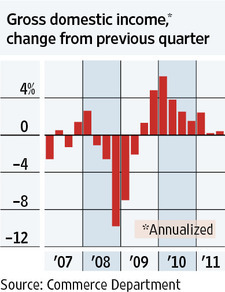 Just yesterday, GDP growth for the last quarter was revised from 2.5 percent to down to 2 percent. Over time, GDP and GDI should match up. On a quarter by quarter basis, they can and do differ. The upshot to take from this is twofold: (1) Measuring the economy is a messy science, and (2) if you had to over-under the GDP growth figures, you'd have cause to go under. The recovery still stinks.